Nearly all Jews in the United States and Israel say they are proud to be Jewish, and large majorities in both countries say they feel a strong sense of belonging to the Jewish people. But the two Jewish communities do not always agree about what it means to be Jewish, according to a new Pew Research Center survey of religion in Israel (compared with our 2013 survey of U.S. Jews). Both surveys asked Jews about a list of eight possible behaviors and attributes that could potentially be “essential” or “important” to their personal Jewish identity. In both countries, majorities say remembering the Holocaust is essential to their Jewish identities (73% in U.S., 65% in Israel). 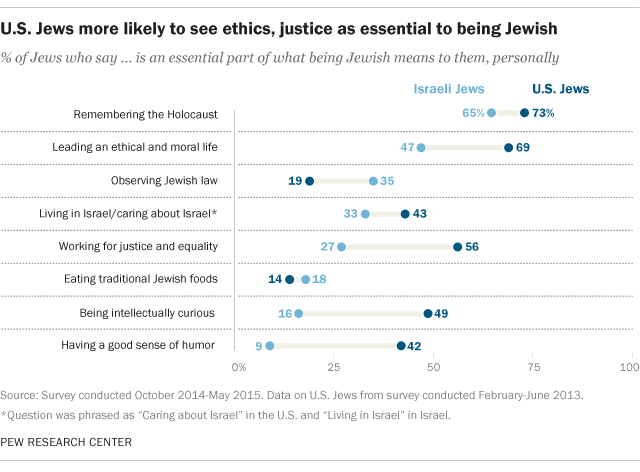 But far more American than Israeli Jews say “leading an ethical and moral life” (69% vs. 47%) and “working for justice and equality” (56% vs. 27%) are vital to being Jewish. American Jews also are more likely than those in Israel to see intellectual curiosity and a good sense of humor as key parts of their Jewish identity. On the other hand, Israeli Jews are more likely than U.S. Jews to say that observing Jewish law is essential to what being Jewish means to them (35% vs. 19%). The list of possible responses was originally designed for our survey of American Jews, which might help explain why Americans responded more affirmatively to these elements of Jewish identity. Both groups also were asked about what being Jewish means to them in a different way, with an open-ended question that allowed them to give any answer. The vast majority of Israeli Jews cited connections with Jewish history, culture and community. In addition, 53% said passing Jewish traditions on to children is crucial to their Jewish identity. Most American Jews, by contrast, did not name an additional essential element of Jewish identity in the open-ended question, perhaps in part because they felt more satisfied with the list of possible responses that had already been offered (among other potential reasons). U.S. and Israeli Jews offer more-similar perspectives on what disqualifies a person from being Jewish. Solid majorities in both countries say a person can be Jewish even if he or she works on the Sabbath, does not believe in God or is strongly critical of Israel. But relatively few Jews in both places say a person who believes Jesus was the Messiah can be Jewish (18% in Israel, 34% in the U.S.). The notion that a person can be Jewish even without observing the Sabbath or believing in God may be tied to the idea held by many Jews that being Jewish is more about ancestry or culture than about religion. Indeed, a plurality of Jews in Israel (55%) and a majority in the U.S. (62%) say this is the case for them personally, although 23% in each country say their Jewish identity is about religion and ancestry/culture equally. About one-in-five Israeli Jews (22%) and a slightly smaller share of American Jews (15%) say being Jewish, to them, is primarily about religion. Orthodox Jews in both countries are particularly likely to take this position. Both surveys asked respondents how important “being Jewish” is in their lives. A slightly larger share of Israeli than American Jews (54% vs. 46%) say it is very important, while somewhat more Americans (20%) than Israelis (10%) say it is “not too” or “not at all” important. A plurality of Israeli Jews (46%) say being Jewish comes before being Israeli for them, but about a third (35%) say they are Israeli first. Secular (Hiloni) Jews in Israel are particularly likely to feel this way: A majority (59%) say they think of themselves as being Israeli before being Jewish. Jewish Americans were not asked whether they are American first or Jewish first.